A Raak Globe floor lamp was used as a prop in the 2008 movie L’Instinct de Mort – Mesrine: Public Enemy Number One (Part 1). The story of french gangster Jacques Mesrine, before he was called Public Enemy N°1. 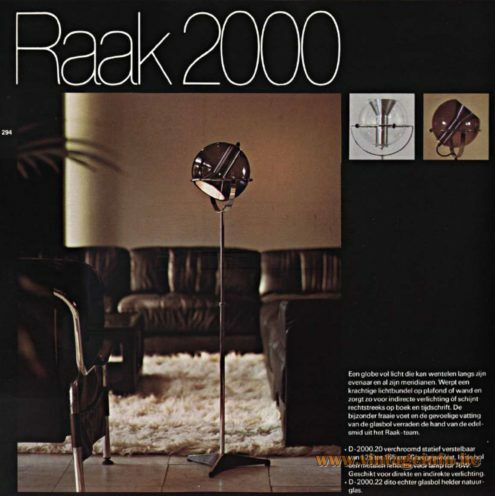 A Raak Globe floor lamp was used as a prop in the 1969 film Paris N’existe Pas from 1969. The story of an artist who uses drugs and develops the ability to see into the future and the past. His hallucinations increase with time. Featuring French singer Serge Gainsbourg and Richard Leduc as the artist. In this scene together with Danièle Gaubert and a Flowerpot pendant lamp designed by Verner Panton in the same year (1969). A Raak Globe floor lamp was used as a prop in the French film Le Clan des Siciliens (The Sicilian Clan) from 1969. A gangster movie by Henri Verneuil featuring Alain Delon, Jean Gabin and Lino Ventura. Many beautiful lamps appear in this movie. Materials: Crystal gray-violet (brown smoked) glass globe. 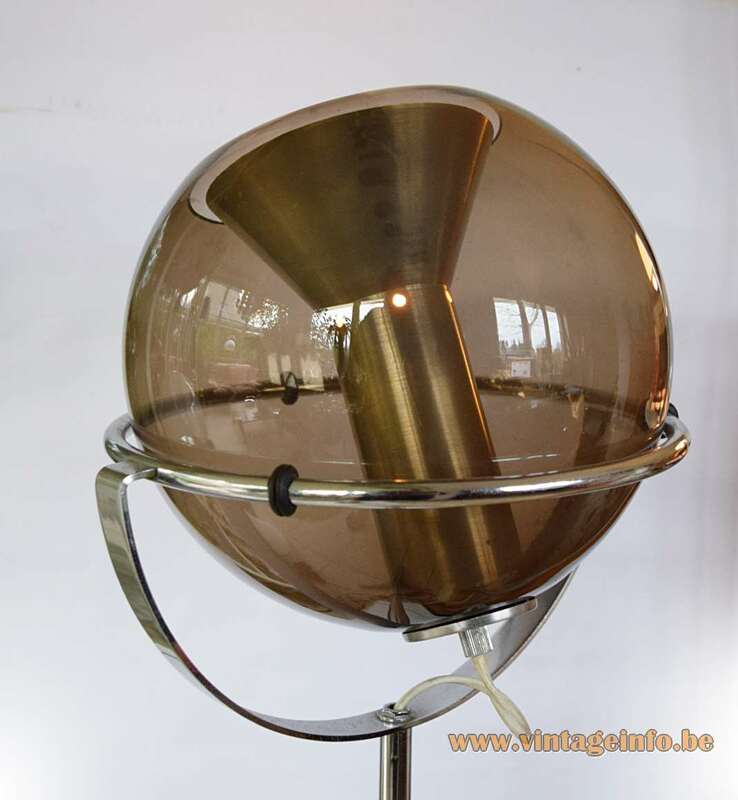 Aluminium reflector and lamp-holder. Chromed metal adjustable rod. Cast iron tripod base. Bakelite socket. Any type of light bulb can be used. For this setup a silver cup light bulb was used. 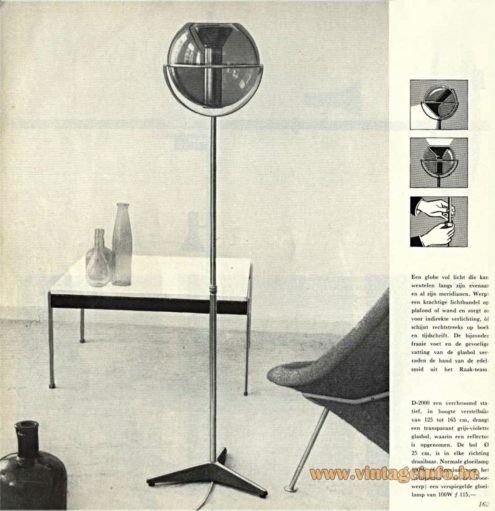 Period: 1950s, 1960s and 1970s – Mid-Century Modern. 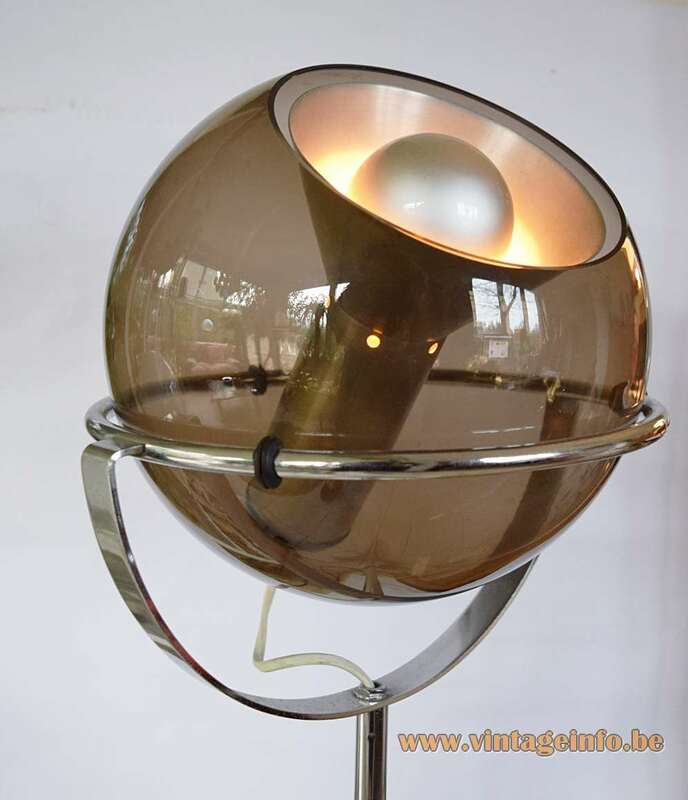 Other versions: Table lamps, pendant lamps, chandeliers, wall lamps. Two types of glass: Gray violet/brown or bright natural glass. 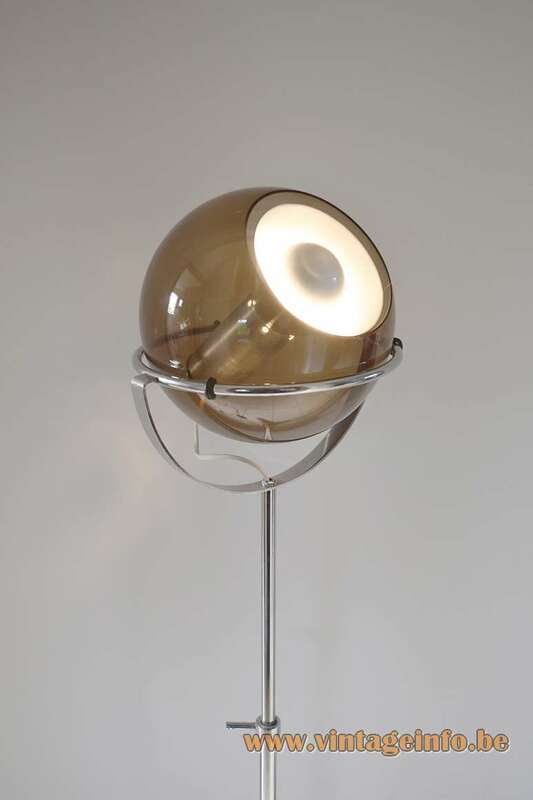 These floor lamps were designed in the late 1950s by Frank Ligtelijn, he was a jewelry designer. They were a big success and were produced for many years. The name of the lamp is Globe, in the catalogue 11 from 1978 it was named 2000. 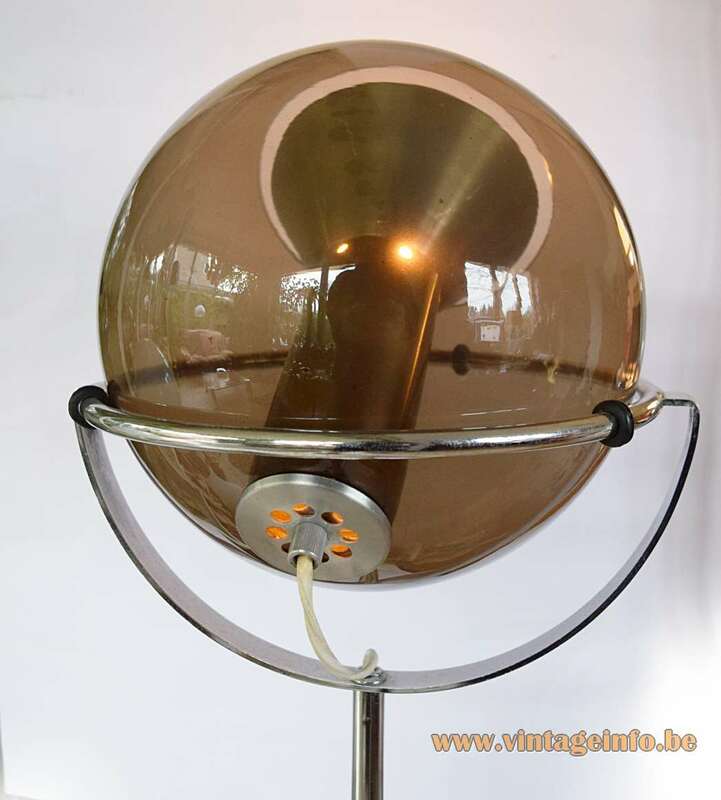 Een globe vol licht die kan wentelen langs zijn evenaar en al zijn meridianen. 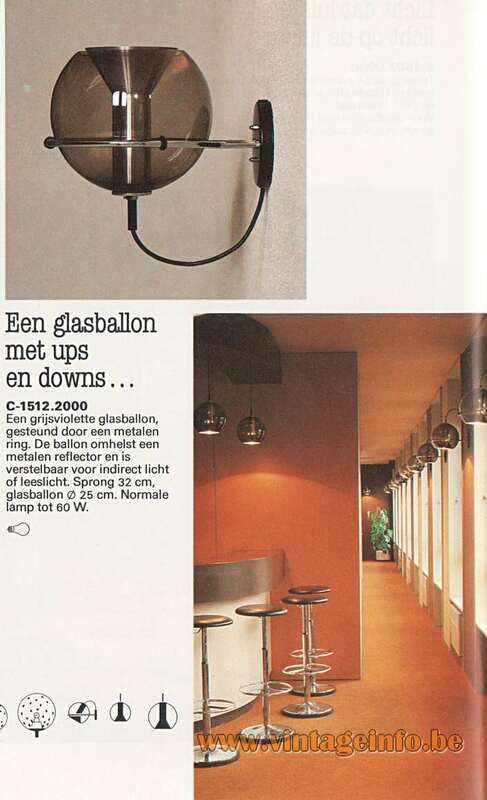 Werpt een krachtige lichtbundel op plafond of wand en zorgt zo voor indirecte verlichting, Of schijnt rechtstreeks op boek en tijdschrift. De bijzonder fraaie voet en de gevoelige vatting van de glasbol verraden de hand van de edelsmid uit het Raak-team. 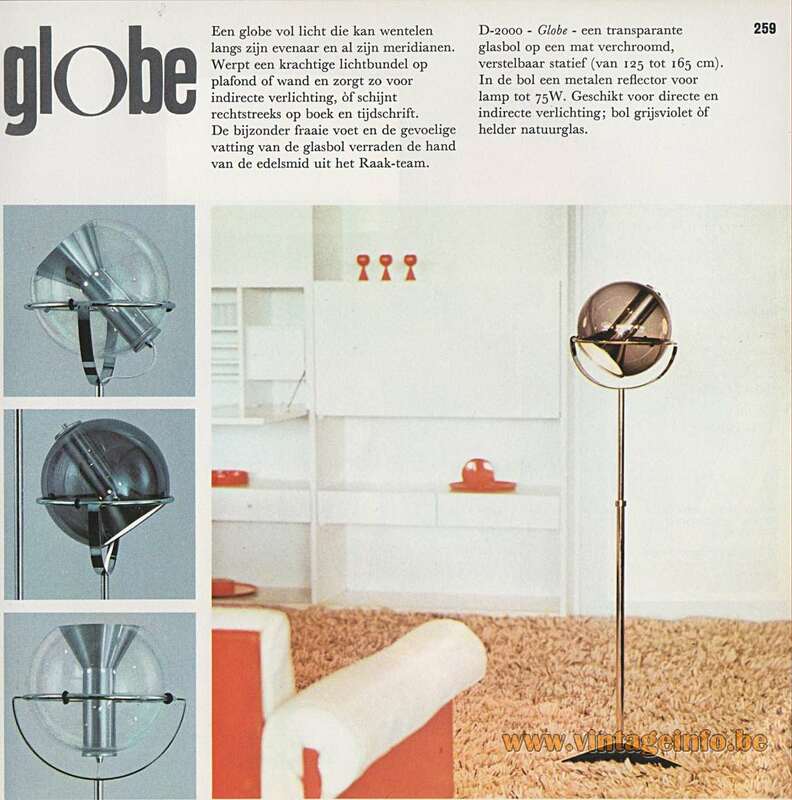 D-2000 – Globe – een transparante glasbol op een mat verchroomd, verstelbaar statief (van 125 tot 165 cm). 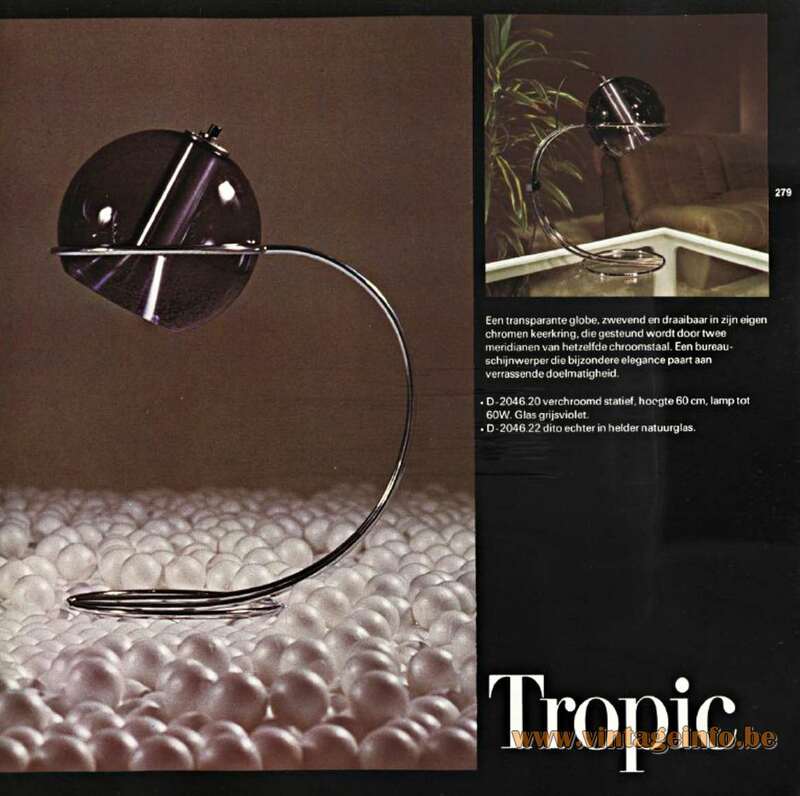 In de bol een metalen reflector voor lamp tot 75W. Geschikt voor directe en indirecte verlichting; bol grijsviolet of helder natuurglas. A globe full of light that can walk along its equator and all its meridians. Sheds a powerful light on the ceiling or wall and thus ensures indirect lighting, or shines directly on book and magazine. 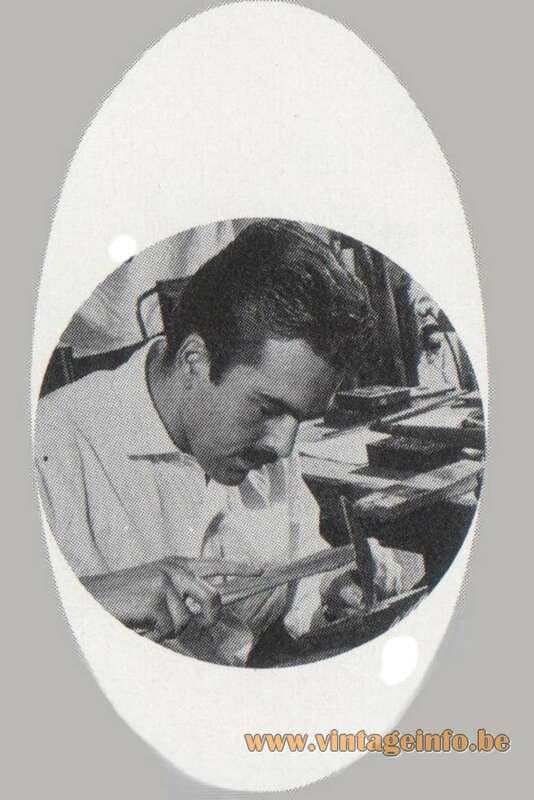 The splendid foot and sensitive perception of the glass bulb betray the hand of the goldsmith from the Raak team. D-2000 – Globe – a transparent glass globe on a chrome-plated, adjustable stand (from 125 to 165 cm). In the sphere a metal reflector lamp to 75Watt. 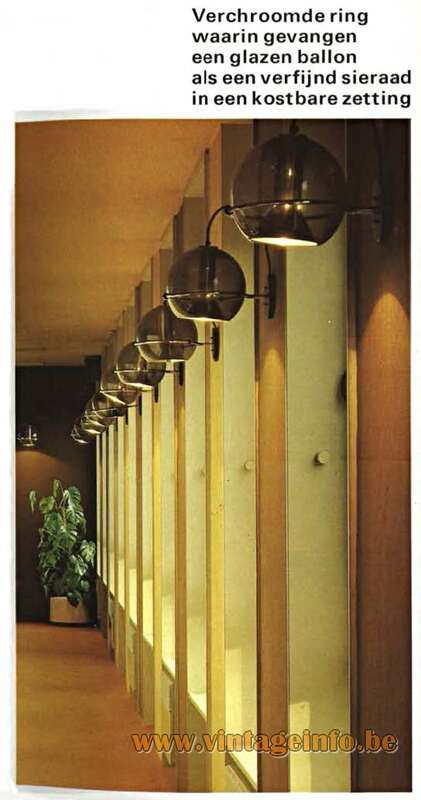 Suitable for direct and indirect lighting; globe Gray violet or bright natural glass. 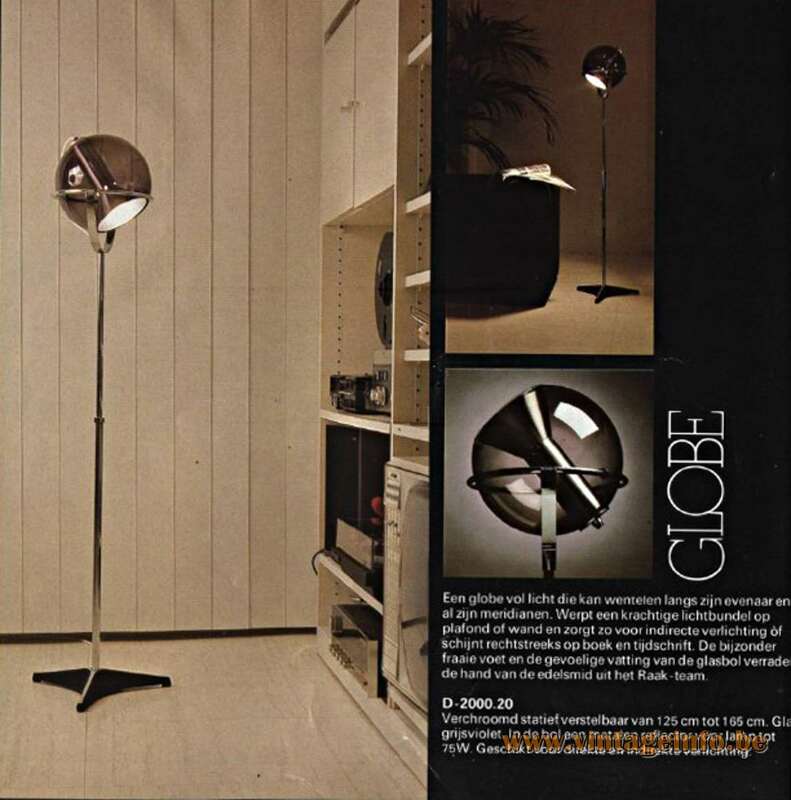 Pricing for the Globe floor lamp in 1962 (catalogue 5) in Dutch guilder, 115,- = +- 60 euro/dollar.